When I created this blog, I had no desire to turn it into the Elizabeth Mandelman show. But since she continues to post half-truths and outright lies and I’ve been banned from commenting on her blog, I’m left with little choice. I agree that once a relationship reaches that degree of violence and abuse, leaving is no easy task. And children most definitely complicate the issue. The point that people like Natasha and Ms Mandelman are missing is that abusive relationships don’t just “happen”. People don’t just wake up one morning and say to themselves “I think I’m going to kick my spouse in the head today.” These relationships evolve over time. The incidents usually start out small and easy to rationalize with thoughts like “they didn’t really mean it”, or “it was an accident”. But over time they gradually become worse and worse, because by staying, the victim is silently telling their partner that their behaviour is acceptable. There are thousands of points along the way where the victim makes the choice to stay and accept the abuse. Patching women up is quite literally, a Band-Aid solution. Education programs in high schools, public awareness campaigns, treatment programs for abusers, an end to our “revolving door” justice system, these would be fantastic starting points to address the issue of domestic violence. Increased restrictions on law-abiding citizens, on the other hand, would not. The Firearms Act has done absolutely nothing to reduce the rates of domestic violence. According to Statistics Canada, a weapon is used in only 7% of spousal assault cases, and it’s female abusers who reach for a weapon twice as often as men. A firearm is used in spousal assault in a whopping 0.1% of cases, 0.08% of the time against women. That’s about 35 women per year. And there’s no indication as to how many of those women are threatened/harmed with a legally registered firearm. At a cost of $100 million per year to maintain the incomplete and inaccurate long gun registry for only 35 victims (specific to their cause), it doesn’t take a rocket scientist to see how deeply flawed the positions of Ms Mandelman and IANSA are. 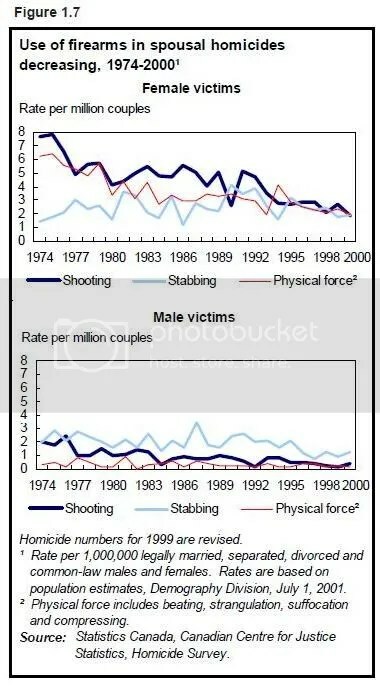 Additionally, the use of a firearm in cases of spousal homicide has been declining since the 1970s. You’ll note from the graph below, that the rate of decline has actually slowed since the introduction of the Firearms Act in 1995. I’ve asked this question before, and I’ll continue to ask it until the “other side” can give me an answer: What could a piece of legislation introduced in 1995 possibly have to do with a trend that started in 1974? I know exactly what she means. I am a firearms owner after all. According to the gun control lobby, my rights are less than the rights of abused women. According to the gun control lobby, it’s perfectly acceptable to limit the rights of 2 million licensed firearms owners for the sake of 35 women. I mean we’re only talking about the right to privacy, the right to a fair trial, the right to be presumed innocent, and the right against unreasonable search and seizure, just to name a few. It’s not like those rights are important or anything. Those 2 million people are downright selfish for fighting to regain those rights when there are 35 women at risk who chose to stay in abusive relationships. How insensitive of those brutish, Neanderthal gun owners. I’ll leave the dripping sarcasm behind to finish with one last part of Ms Mandelman’s blog. Second-hand clothes and sleeping in a dorm are not exactly one of life’s great hardships. Having done so for many years myself, I wouldn’t call it a hardship at all, but I realize that’s a highly subjective point. If it concerns Ms Mandelman that much, maybe she should consider just how many new sheets and clothes $100 million per year could buy these shelters. As to her claim that firearm ownership is only a privilege in Canada, well I now have the happy job of informing her that she’s incorrect. I’ve recently been educated on that point myself. The details can be found here about halfway down the page under the section titled Right to Bear Arms. As Ms Mandelman correctly stated, in Canada we do have the right to security of the person. This is the part where I get a little bit fuzzy about the gun control lobby’s stance. They claim to be fighting their campaign in the name of public safety, or in this case for the reduction of domestic violence. How then, do they justify taking away the very tool that a woman might use to protect herself?